For all the fashionistas out there I'm sure you've seen the Adele cuff as one of the "must haves' for this summer accessory??? The bold circles is what forms the intricate bracelet, it measures 2.5" inner diameter and 3" in width on the wrist. This will fit mainly medium and large wrists...and it comes in either 14kt gold-plated or silver-plated. From the "Passage to India" collection the Adele cuffs and currently listed as one of the Summer Style for a Steal! The silver plated is on SALE so be sure to check it out! What does blue mean to you? Nothing sad I hope although that's what some mainly connect with a feeling. I found that blue can mean many things: Calmness and Serenity or Vigilance or Perseverance. Blueberry Barrettes - a pair of Light Sapphire Glass Beaded Hair Jewelery that measure approximately 2 inches. Crystal Blue hoop earrings that were handcrafted with teal blue czech glass beads wire-wrapped around 4 in diameter silver hoops. These are all OOAK hand-crafted items....so why not be blue and stop by Simply Shop|323 today! 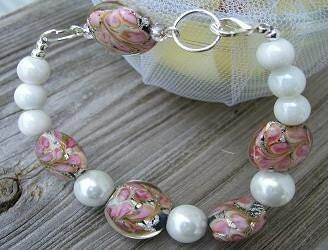 I just just added a new lamp work beaded bracelet called Rose Swirl. The pink swirls have an illusion of a flower all adorned by off-white pearls and a silver lobster claw clasp. The bracelet measures approximately 7 inches and would be great a addition to any wardrobe. Get it today as it is ONE of a kind and can be purchased through Simply Shop|323.